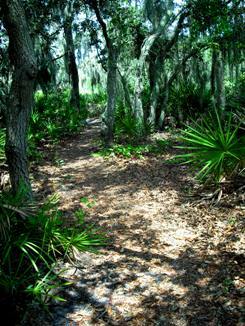 This past weekend I drove down to Balm Boyette Scrub Preserve located near Tampa Florida to check out the trails. I have been there once previously to mountain bike on the singletrack trails developed and maintained by the SWAMP Mountain Bike Club based out of Tampa. This beautiful preserve is just under 5,000 acres in size and includes a variety of singletrack and service roads along with a dozen lakes. Natural habitats include sand pine scrub, xeric oak scrub, pine flatwoods, hardwood hammock, marshes, and swamps as well as grassy meadows. There are 6 miles of hiking trails and 18 miles of mountain biking trails within the preserve. 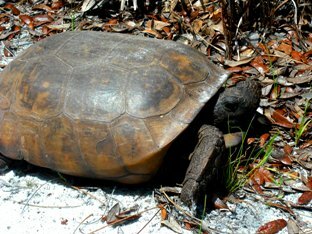 If you are lucky, you may even see protected wildlife species including the gopher tortoise. There is a portajohn at the trailhead, however be aware that there is no running water at this location. Be absolutely sure to carry water with you, this park gets very hot and dusty during the summer months. There are 6 miles of hiking trails located across the street from the parking area which are available for trail running. On the mountain bike side of the road, there are also trail running opportunities but these are limited to service roads. The mountain bike singletrack trails tend to be technical, rocky and unsuitable for most trail runners. There are also many blind corners where potential conflicts between bikers and runners are possible if not probable so for everyone's safety please use common sense. 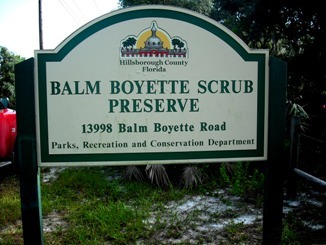 The entrance to the preserve is located on Balm-Boyette Road just east of I-75 at exit 246/Apollo Beach (Big Bend Road/CR 672). Go east on Big Bend Road to US 301, turn right onto US 301 and head south for approximately 1.5 miles to Balm Road/CR 672. Turn left onto Balm Road/CR 672 and continue east for 5.2 miles. Turn left onto Balm-Boyette Road and continue north for 1.3 miles until you see the parking lot located on the east side of the road. The parking lot is rather small so be prepared to park along the road if need be. There are no fees at the Balm Boyette Scrub Preserve at this time.